Spring is a wonderful time to explore the Byron Hinterland and Ballina coastline by bicycle. Fun for all the family. The comprehensive bicycle tracks around Ballina are perfect for all ages. Cycle along North wall out to the entrance of the Richmond River or follow the tracks along North Creek at Ballina. The cycleways are now extended towards Lennox Head with some magnificent views and plenty of coffee or picnic spots to take in on your way. Don’t have room for a bike? Visit www.thebicycleemporium.com.au for all your cycling needs. Based in Ballina they have all sizes of bikes and mountain bikes available for hire. Or if off road mountainbiking is your thrill. Or you want to try mountain biking for the first time. 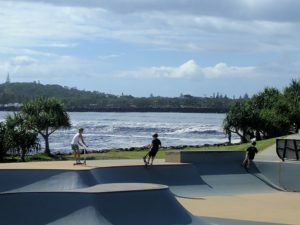 The skate park at Ballina is great fun too. Bikes, boards or scooters. Plenty of space to sit and watch the spills and thrills or charge up the bbq and enjoy the view. Hope to see you soon with all your bikes on board!! Book now at www.alstonvillecottages.com and enjoy the breeze. !